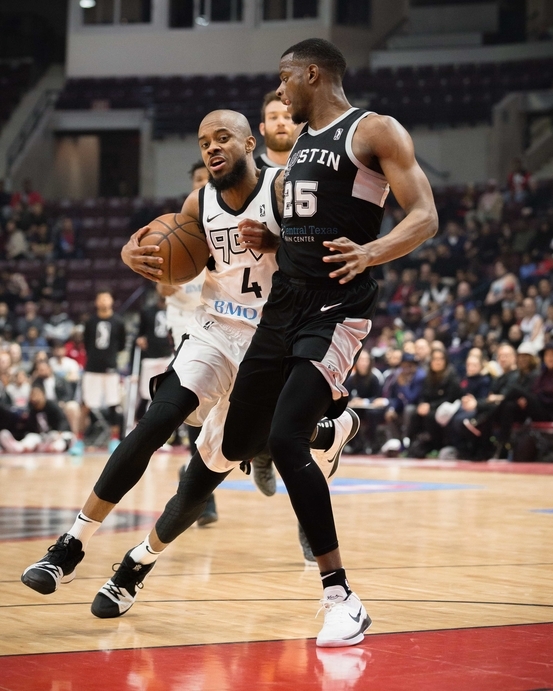 MISSISSAUGA, ONT- Game 2 of the 2018 NBA G-League Finals went down Tuesday night between the Austin Spurs (1st, Western Conference, 32-18) and the Raptors 905 (4th, Eastern Conference, 31-19). 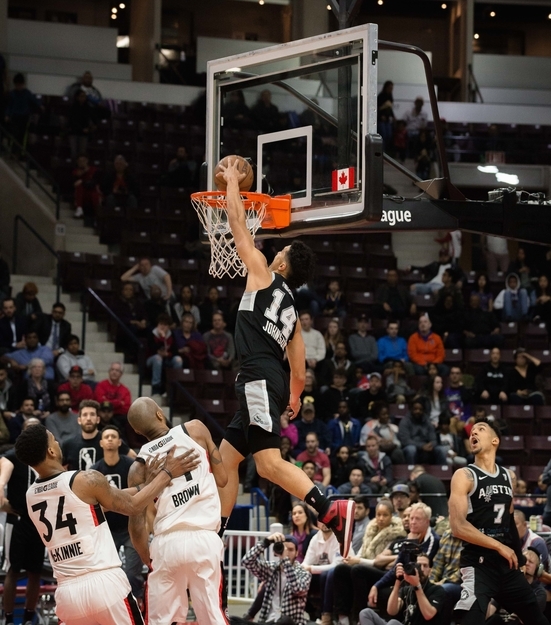 The 905 looked to bounce back at home after losing Game 1, 105-93, on the strength of 35 points from Derrick White. With a win, the 905 would force a third and deciding game. 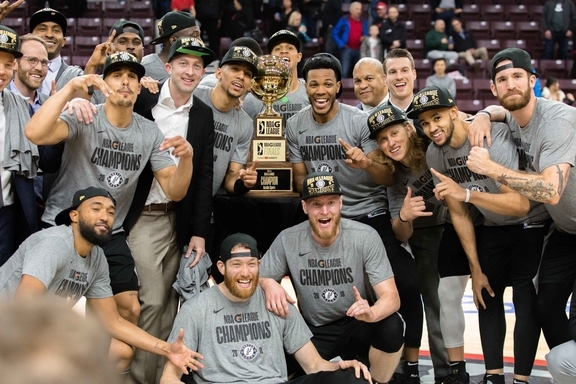 A loss, however, and the Spurs would hoist the G-League trophy on the 905’s home court. 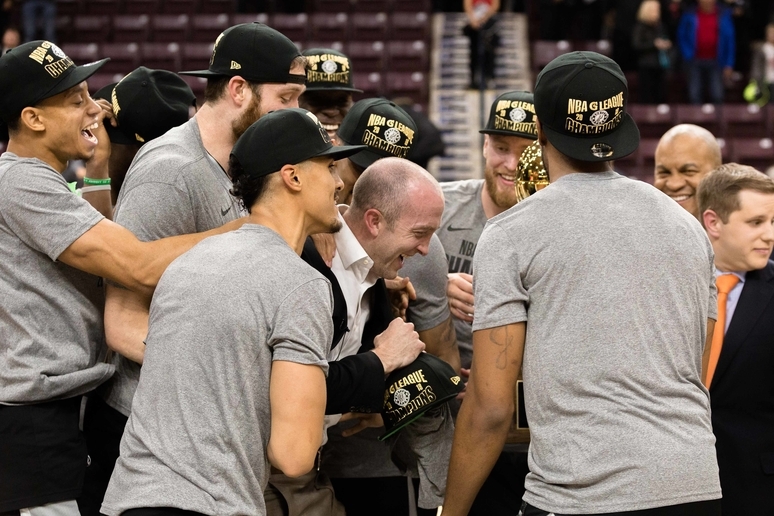 Austin used a 23-2 run early on in the fourth quarter to turn a fairly close game into a laugher as they beat the 905, 98-76, in front of 3,262 fans at the Hershey Centre, winning the best-of-three series in two games. 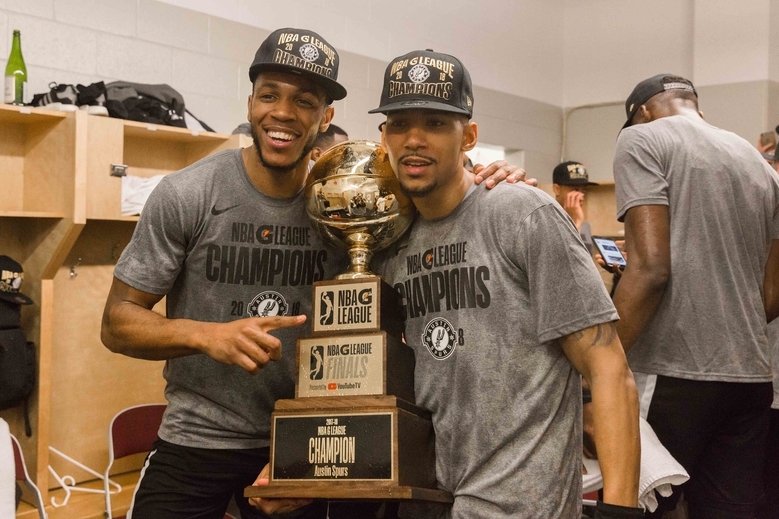 It marks the first title for the Spurs since 2012 when they were named the Austin Toros. 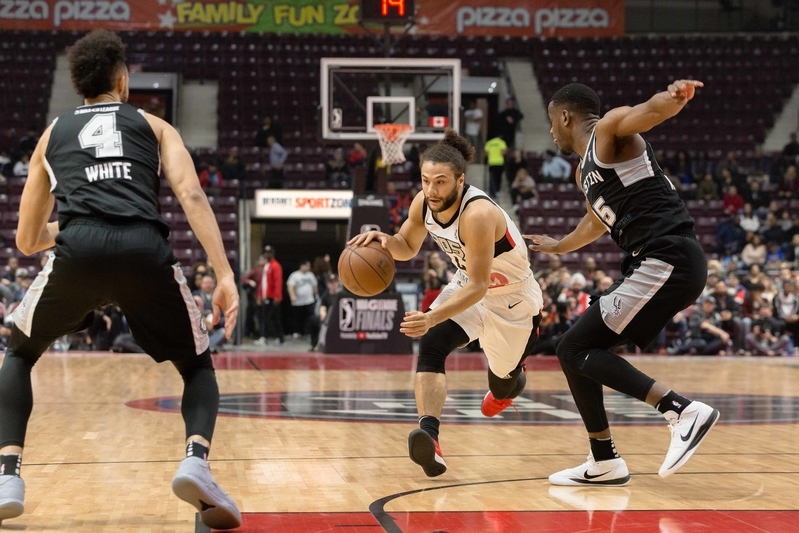 Nick Johnson was named G-League Finals MVP after averaging 17.0 ppg during the series on 52.2 per cent shooting from the field and 80 per cent from downtown. He finished with a game high 17 points on five triples off of the bench, spearheading a Spurs second unit that outscored the 905 bench, 49-32. 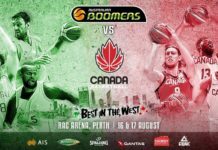 Jeff Ledbetter scored 16 points, making his first six shots, while the Canadian Hanlan finished with 14 points and a team high seven assists. Jaron Blossomgame scored 11 of his 15 points in the third quarter and secured a game-high 10 rebounds while Darrun Hilliard chipped in with 12 points and White had four steals. 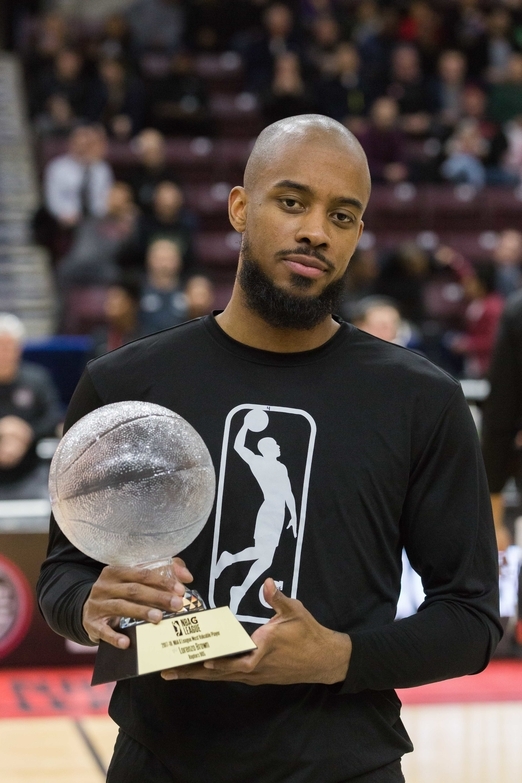 Lorenzo Brown finished with a double-double, with 11 points and a game high 10 assists and was presented with the G-League MVP before the game. The North Carolina State product was second in the league with 8.9 apg and averaged 18.8 ppg, but only had two points in the second half. Malcolm Miller and Canadian Kaza Keane each had 12 points to pace the 905 while Kennedy Meeks had 11 points and a team-high nine rebounds. Fuquan Edwin had a game high five steals. The Raptors 905 did have the edge in the free throw category (22-7), second chance points (18-15) and points in the paint (40-28). But all of that was offset by the Spurs outscoring the 905, 45-6, from behind the arc (15-41). Meanwhile, the Raptors shot a paltry 7.4 per cent (2-27) from downtown and shot just 35.1 per cent overall. Austin also had the edge in assists (28-17), steals (14-10), and scored 25 points off of 21 Raptor turnovers. However, they did hold Austin to 98 points and limited them to 43.2 per cent from the field despite allowing 15 triples. Things also got chippy late in the fourth quarter as Hanlan tossed the ball off of Meeks after a foul and a brawl nearly ensued before calmer heads eventually prevailed. When the dust settled, Meeks was ejected while Hanlan, Ledbetter, and Stackhouse each received a technical. The 905 fed off of the energy from their fans early as they went up 12-5 six minutes into the game. However, on the strength of a perfect shooting first quarter from Hanlan and Ledbetter combined (8-8, 18 points), Austin took the lead for good using a 23-6 run to close out the first quarter as they went up 28-18. 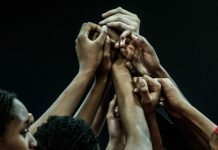 A triple from White gave the Spurs their largest lead of the half at 13 (33-20) but the 905, slowly began to chip away at the deficit by hitting nine free throws in the quarter alone, eventually trimming it to five after a pair of free throws from Alfonzo McKinnie. But another triple from Ledbetter gave the Spurs a 46-38 lead at the half; he had 13 first half points on a perfect five of five from the field. Meanwhile, Brown paced the 905 with nine points and six assists at the half, and hit the 905’s first triple with 2:38 to go in the first half. The 905 came out of the locker room inspired to start off the second half as they scored the first seven points of the third quarter, capped off by a dunk from Aaron Best, to cut the Spurs lead to one (46-45), forcing Austin coach Blake Ahearn to call a timeout as the crowd went into a frenzy. The Spurs responded out of the timeout with a 15-4 run as they stretched the lead to double digits, going up by as many as 15 in the quarter after five straight points from Julian Washburn. 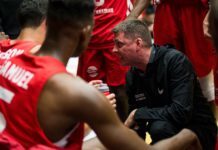 Austin was one quarter away from winning the title as they were up 73-62, after three quarters, despite Miller’s 10 points in the quarter for the 905. A floater from Keane cut the Spurs lead back to single digits but that was as close as the 905 can get as Hilliard scored eight straight points, including a pair of threes, to spark a momentum changing 23-2 run to pull away from the home team, going up by as many as 30, causing the home crowd began heading for the exits. Both teams then emptied their benches and when the final buzzer eventually sounded, the Spurs went into a frenzy, celebrating their second title in franchise history. After winning the 2017 G-League Championship, only Negus Webster-Chan remained on this year’s playoff roster from last season. 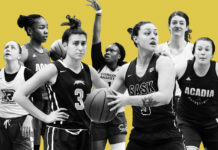 The 905 started off the season in a rough manner with a 5-10 record but used a 10 game winning streak to spark them in finishing with a 31-19 record, which was the third best record, percentage wise, in the league. 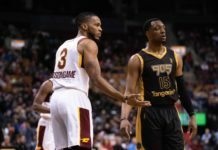 The Raptors delved into USports for talent last offseason, picking up Aaron Best (Ryerson) and Kaza Keane (Carleton); Best scored a season-high 23 points in the Eastern Conference Finals against the Erie BayHawks on April 6, while Keane dished out a franchise record 15 assists against the Texas Legends on Dec 13, 2017. 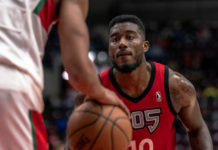 Meanwhile, mid season acquisitions in Fuquan Edwin, Malachi Richardson, and Shevon Thompson provided a spark on both ends of the floor for the 905 in making their second straight G-League Finals appearance. The work ethic from the players and the want to get better, even staying in late after practice, proved to be instrumental. 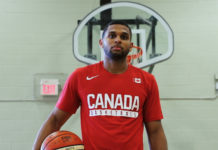 Note: On Wednesday the Toronto Raptors converted Lorenzo Brown’s contract to a standard NBA deal, thus he is available to suit up for the big club in the playoffs. When Hanlan came onto the floor, the Spurs were down 12-5 with 5:55 to go in the first quarter as offense was hard to come by. 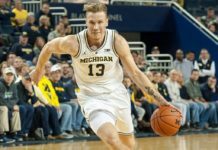 By the end of the game, he finished with 14 points on 50 per cent shooting from the field, showed off his playmaking with a team high seven assists and was a +33 in his 25 minutes on the court. Hanlan scored eight first quarter points and even dished out two assists in the quarter. He was effusive in his praise of the Spurs head coach, who won a title in his first season coaching. 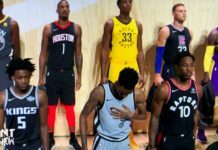 In his first season with the Spurs, Hanlan finished fourth in team scoring with 14.7 ppg, shooting 45.7 per cent from the field and 37 per cent from beyond the arc, showcasing his skills on the offensive end. After two seasons of playing overseas, Hanlan is back with the intent of getting back to the NBA. Until the moment he makes it to the big leagues, this moment of being a G-League champion is one that he will enjoy for a while. 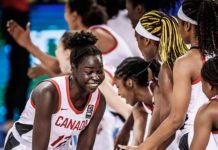 “It feels amazing, being a champion,” Hanlan said.